Electroanatomical mapping is a mandatory time-consuming planning step in cardiac catheter ablation. In practice, interventional cardiologists target specific endocardial areas for mapping based on personal experience, general electrophysiology principles, and preoperative anatomical scans. Effective fusion of all available information towards a useful mapping strategy has not been standardised and achieving the optimal map within time and space constraints is challenging. 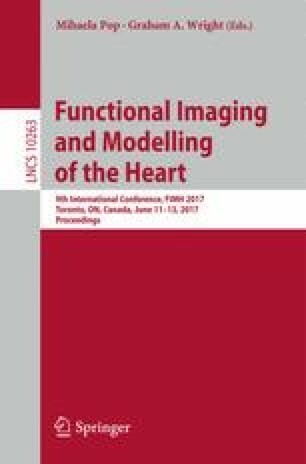 In this paper, a novel framework for computing optimal endocardial mapping locations in patients with congenital heart disease (CHD) is proposed. The method is based on a statistical electroanatomical model (SEAM) which is instantiated from preoperative anatomy in order to achieve an initial prediction of the electrical map. Simultaneously, the anatomical areas with the highest frequency of mapping among the similar cases in the dataset are detected and a classifier is trained to filter these points based on the electroanatomical data. The framework was tested in an iterative process of adding mapping points to the SEAM and computing the instantiation error, with retrospective clinical data of 66 CHD cases available.